According to new research by Venkat Kuppuswamy, who is an assistant professor of entrepreneurship and innovation at Northeastern University, customers are less willing to pay top dollar for a product made by a black entrepreneur than they are for the same product made by a white entrepreneur. Kuppuswamy and his collaborator, Peter Younkin from the University of Oregon, found that this is because customers assume that the black entrepreneurs will use lower-quality materials and spend less time making the product. "The crowd is not colorblind, as one might hope," Kuppuswamy says. "In fact, we found that bias does exist, and that that bias is subconscious; people have a subconscious bias that black entrepreneurs have a lower cost of production." 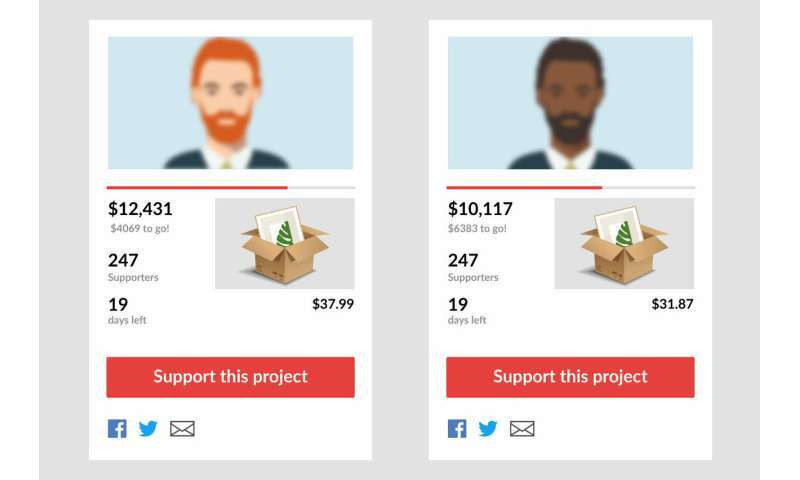 Crowdfunding platforms, such as Kickstarter, Indiegogo, or GoFundMe, are websites where people can make a public pitch for funding, either for a product they're creating or a cause they're supporting. The business model relies upon a large number of people pledging relatively small amounts of money in order to reach a set financial goal. Typically, Kuppuswamy says, would-be entrepreneurs use crowdfunding sites to raise money to cover the upfront costs associated with getting their products off the ground. Kuppuswamy, who studies these types of platforms, spends a lot of time talking to entrepreneurs about how well the platforms are working. "The big hope for crowdfunding is that it would create a democratic platform for anyone to present ideas that would be funded on their merits," Kuppuswamy says. But, when he spoke to entrepreneurs who were also racial minorities, they tended to be less optimistic about crowdfunding platforms and how successful they were as a tool to reach funding goals, he says. "You hear that once, and it's an anomaly; twice, and it's interesting; three times, and it's a research question," Kuppuswamy says. So, he set out to determine whether there exists a bias within the crowd doing the funding. He found that there was. In a study published in 2017, Kuppuswamy and Younkin found "that African American men are significantly less likely than similar white founders to reach their fundraising goals and that prospective supporters rate identical projects as lower in quality when they see the founder is an African American male." Then, Kuppuswamy and Younkin wondered if such biases affected the price of these products. Their new research, which appears in the March 2019 issue of Journal of Business Venturing, is a complementary experiment to the first. This time, Kuppuswamy and Younkin zeroed in on the products themselves. They wanted to see not whether customers would help entrepreneurs from racial minorities reach their funding goal, but more precisely, how much they'd be willing to pay for these products. "One of the biggest decisions entrepreneurs make on these platforms is what to set for the price of their product," Kuppuswamy says. That's because the price you charge for a product, he says, has a direct influence on the amount of money you can make overall. Price your product too low, and you won't be able to recoup the cost of materials and labor. Too high, and people won't buy it. To test how much customers were willing to pay for a product, Kuppuswamy and Younkin designed an experiment around a real product from the crowdfunding site Kickstarter. It's a wooden tray with a charging jack designed to hold a cell phone and keys. It was a good fit, Kuppuswamy says, because the original video pitching the product included no indication of the race of the creator. They also conducted a survey to determine whether the product itself was something customers associated with any particular race. It wasn't. The researchers wanted to test whether the race of the founder would affect how much the crowd would pay for the product. So, they created two different crowdfunding webpages for the tray. One page included a photo of a white man whom Kuppuswamy and Younkin described as the company founder. The other webpage included a photo of a black founder. On both pages, the researchers added identical text "from" the founders, which read, "I wanted to provide finely crafted products…" and described the founder as "an industrial designer and former high-end furniture designer." But they created a third page, too. This third webpage was identical to the product page with the black entrepreneur except that it included the text, "I wanted to provide finely crafted African-American made products…" and described the founder as "a Black industrial designer and former high-end furniture designer." "We further emphasized the founder's race, just to see what would happen," Kuppuswamy says. Using Amazon Mechanical Turk, an online platform that gives researchers access to hundreds of thousands of willing participants, Kuppuswamy and Younkin recruited and vetted 326 people from across the United States to participate in their experiment. Those 326 people were then randomly sorted into three experimental groups: One group was presented with the webpage for the white entrepreneur, another was presented with the webpage for the black entrepreneur, and a third was presented with the webpage for the black entrepreneur that also emphasized his race. Through a survey, Kuppuswamy and Younkin asked the people in each group to recommend a price the entrepreneur should charge for the tray. The first group recommended an average price of $29.11 for the tray when they thought it was made by a white entrepreneur. The second group recommended an average price of $22.99 when they thought it was made by a black entrepreneur. That's a difference of more than $6, or a 21 percent drop in the price for the product just because the founder was black. "That's a very significant drop: a clear price penalty for a minority race," Kuppuswamy says. The third group recommended an average price of $25.21 when they were presented with a product that emphasized that the founder was black. That's a difference of $3.90, or 13 percent, from the product by the white entrepreneur. Kuppuswamy says this particular shift upward in price for the emphatically black-founded product could be because people feel pressure to "be politically correct." "When you signal very strongly someone's race, people may feel like they need to be politically correct, and they potentially act more favorably than they otherwise would," he says. Still, the question of why people were less willing to spend money on a product they thought was made by a black entrepreneur lingered. Kuppuswamy and Younkin tested several theories and found a "subconscious bias that black entrepreneurs have a lower cost of production," Kuppuswamy says. The researchers found a solution as well: The price people recommended for the products changed significantly when they added a phrase to the webpage describing how much the materials cost and how long it takes to make each tray. Once their subjects had this information about the materials and labor, they were less likely to recommend different prices for products by white entrepreneurs versus black entrepreneurs. The fact that the price difference disappeared once customers were given this extra information showed that the crowd expected black founders to have a lower cost of production than white founders, Kuppuswamy says. "It's evidence that providing the cost of the materials and the time it takes to make the product puts black and white founders on equal footing," he says. "It's terrible that this bias exists, but a solution is available."